Some place to go. 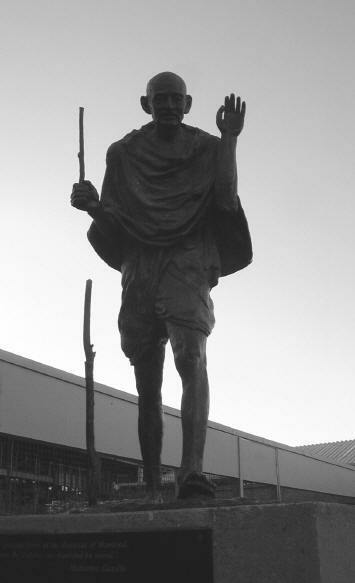 What shall we do with our statue of Gandhi, which has been shoved into oblivion behind the ferry building? Long forlornly ignored by bay crossers, the poor fellow recently received a blow to the staff from vandals or careless construction workers. It’s a rather sweet unprepossessing figure, wasted on the bustling pier. There has been talk of removing the statue of Simon Bolivar from UN Plaza, its heft out of scale with the low-lying shrubs and fences. Why not replace the large equestrian with a life-sized man on foot, whose humble demeanor might not be out of place there? Religious Witness with Homeless People will sponsor an assembly of religious leaders, homeless people, elected officials, and civic leaders at City Hall September 23-24, seeking the creation of emergency shelters “as the harsh reality of winter approaches.” Scheduled events include a prayer service and rally at 2:00 Sunday afternoon, followed by an overnight sleep-out on the steps. A candlelight procession beginning at 7:15 p.m. Monday will include the delivery of a formal appeal to city officials. A translation of the report can be found at www.narconews.com (scroll way down). Watch where you’re going. If you’re planning to wander around Europe in the next few months, don’t be surprised if someone’s watching you. Following the demonstrations in Genoa last month, the (London) Independent reported on August 20, national leaders in the European Union have ordered police and intelligence agencies to coordinate their surveillance of the protestors. They rejected a proposal by German Interior Minister Otto Schily to form a Europe-wide police force, but “Europol, the EU police intelligence-sharing agency based in The Hague that was set up to trap organised criminals and drug traffickers, is likely to be given a key role.” Civil rights activists’ hackles have risen at the prospect of legal actions by demonstrators becoming fodder for criminal data banks. There’ll always be an England. A Hertfordshire psychologist named Richard Wiseman has issued a serious call for jokes, according to an Associated Press story forwarded by Rick Knee. Taking as his premise the observation that humor heals, Wiseman would like to know why. His plan: to nail down the nation’s funniest story and tell it to a fellow with wires attached to the frontal lobe of his brain, so as to electronically monitor his reactions. Kind of takes the fun out of fun. But maybe it’ll be worth the effort: Wiseman promises to reveal the Miss Universe of English jokes on his website next September.